We care about our community and are dedicated to keeping the peace. Chief Joseph A. Beavers is a Prescott Native graduating from Prescott High School. He began his law enforcement career in 1988 as a Military Policeman with the US Army. 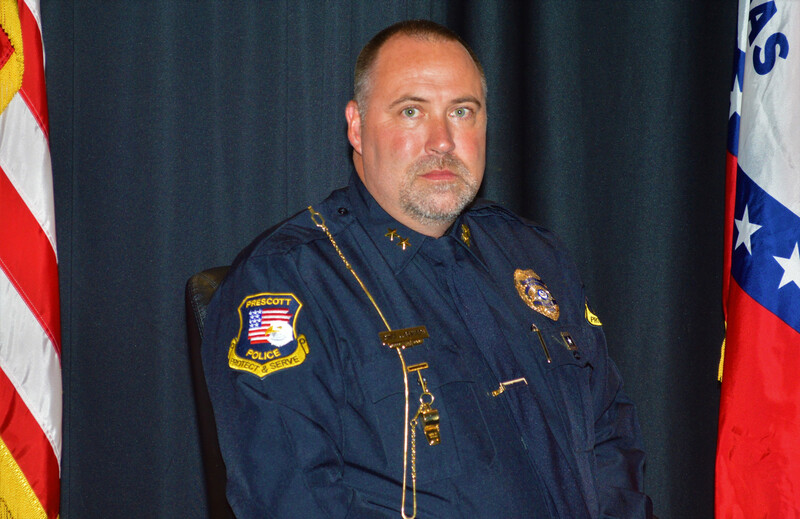 He began his civilian career in 1992 working with the Ft. Smith Police Department. Since that time, He has served as a Patrol Agent with the US Border Patrol and also served for nearly 12 years as a Special Agent with the Arkansas State Police Criminal Investigations Division. In 2011 He became the Assistant Chief of Police for the City of Prescott Police Department, and in March of 2017, he was appointed as Chief of Police for the department. He has been married to his wife Rhonda since 1990, and they have 2 children, Josie and Austin, and one grandson. Chief Beavers believes in a well trained, professional Police Department. His motto is "Just because we are a small-town police agency, doesn't mean that we have to act like one". The Prescott Police department is responsible for law enforcement activities located within the 6.56 square mile limits of the City of Prescott, which is the County seat of Nevada County. The department currently consists of 10 full time officers, 2 part time officers and 1 civilian Admin Assistant. Responsible for the overall administration of the department. The Patrol Lieutenant is the second in command of the department. He is also the first line supervisor for the Patrol division as well as the School Resource Officers and Warrant Officer. There are 7 officers assigned to the Patrol division Including the Patrol Lieutenant, 4 full time patrolman and 2 part time patrolman. These officers are responsible for all patrol activities within the jurisdiction. There is currently 1 Detective assigned to the CID division. The detective is responsible for all criminal and narcotic investigations within the department. There are 2 officers assigned as School Resource Officers. These officers are responsible for all activities relating to the Prescott schools ranging from Elementary to the High School. The Administrative Assistant is Responsible for overall operation of our administrative Office. This includes receiving bond and fine money, Citation input, and record management.